Chianti wines aren’t as simple to understand and appreciate as you might imagine (unless: you are in that moment when wine is swirling around your tongue). In fact the Chianti region of Tuscany is broken into 8 smaller regions, each with their own set of standards and requirements for making Chianti. Each region is intimate with its micro-climate, wine-makers, multi-generational growers, old traditions and new technology. The 8 districts in the Chianti region are: Classico, Ruffino, Colli Fiorentini, Colli Aretini, Colli Senesi, Colline Pisanel, Montespertoli and Montalbano. DaVinci Wines---and the town of Vinci---are in the Montalbano region of Chianti. Located in the northeast quadrant of Tuscany, Montalbano is nestled between Florence and Pisa, just 60 meters above sea level. DaVinci Wines are the result of a cooperative of 230 members hailing from 78 vineyards. The cooperative, Cantine Leonardo da Vinci, was formed in 1961 and is celebrating their 50th year. Chianti is a dry red wine, medium bodied, with notes of cherries and violets. In general, Chianti wine includes a minimum of 70% and up to 100% sangiovese. 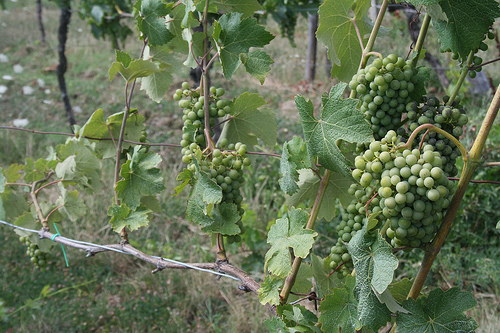 In addition to sangiovese (there are 12 varieties of sangiovese across Tuscany), tradition puts the black Canaiolo and white Malvasia and Trebbiano grapes into the Chianti blend. More commonly, Chianti includes its requisite sangiovese and a blend of additional reds---including merlot, syrah, and cabernet---to round out the wine. Aging, blending and bottling requirements vary from region to region. Chianti Superiore and Chianti Riserva wines are aged longer---and have more to prove---than straight-shooting Chiantis. Additionally, there are 3 categories that qualify Italian wines: IGT, DOC and DOCG. IGT states the basic information: the region, varietals and vintage. DOC requires specific aging, barrels, varietals and processing. DOCG increases those aging and quality requirements; the entire Chianti region (all 8 districts) enjoys the possibility of DOCG status. A cooperative will often produce a combination of IGT, DOC and DOCG wines.